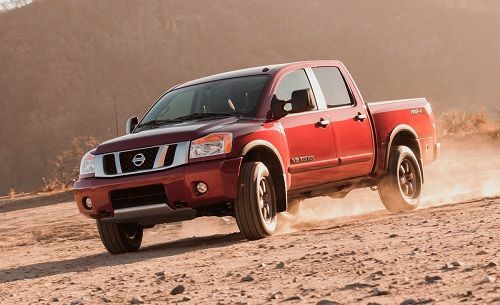 Nissan will give the Titan pickup truck a long overdue redesign in 2014. Although Nissan trails the GMC Sierra, Chevy Silverado, and Ford F-150 things are looking bright for Nissan. Nissan is preparing to launch an all-new 2014 Titan pickup truck. The Nissan Titan is a low volume pick-up in the US, but Nissan builds other products on the platform, including work vehicles that it sees as important, and potentially growth-oriented. The new Nissan Titan will be just one part of the product line refresh that Nissan is undertaking. In the full size pickup-truck world there are mainly two entrants, the Ford F-150 series and the Chevy Silverado / GMC Sierra twins. Ram also has a popular model that it calls –ahh, the Ram. (Formerly the Dodge Ram) Following these three is the Toyota Tundra. Nissan introduced the Titan in 2003 in order to supplement its sales. The truck is not expected to compete head to head in terms of sales volume with the big two, Ford and GM. Nissan openly admits the truck was meant for “personal-use customers.” In other words, not contractors. (Particularly not union contractors) The Titan has neither the product line depth to properly compete. However, you may be aware of a little electric runabout that Nissan has spent billions developing and which is reported on daily by the mainstream media, as well as automotive expert sites like Torque News. Well, the Titan outsold the Leaf two-to-one last year and that trend is not showing any signs of changing. It is also likely that the Titan is far more profitable for Nissan than the Leaf. Therefore, a new Titan, refreshed after about 13 years on the market is a worthwhile investment for Nissan. Going Forward Nissan hopes to continue to carve out additional slices of the truck market for itself. Seeing a door open in the contractor business that required a full size van, Nissan invested in a new line of commercial vans. You can read more on that vehicle by clicking here. Ford is the primary competitor for that vehicle and the new Ford Transit van is also all-new and more of a departure from prior generations. Pierre Loing, vice president, Product and Advanced Planning and Strategy, Nissan Americas summarized Nissan’s plans for the Titan this way; "As a full-line manufacturer, Nissan aims to be a player in every part of the truck business. Our truck teams in Michigan, Arizona, Tennessee and Mississippi are hard at work on a next generation full-size truck line that will expand Titan's appeal to a broader spectrum of truck buyers, including the all-important skilled trades-buyers. Our new truck will be filled with Nissan innovation and expertise without compromise." One may interpret the “Skilled-Trade” comment as meaning “Contractors who buy non-union made vehicles.” They are rare. Nissan’s new Titan will very likely have a more powerful V8 derived in part from its successful racing program, and also be more fuel efficient. There is also a good chance that the Titan will come in more variations than it does now. Although it would seem that Nissan has an uphill climb competing with Ford and GM, who sell literally 600,000 to 700,000 of their trucks each year compared to Nissan’s 22,000 Titans in 2012, it will be a lot easier for Nissan to increase Titan sales 10% than for either of the other players in the marketplace to do so. It is also good to keep in perspective that Nissan sells more Titans than it does Leaf’s, 370Zs, and GT-Rs combined. The new Titan wont compete with the F150 any more than the Altima Coupe competes with the Mustang. The only chance that Nissan had to build a decent truck went out the window when Marchionne took the reins at Chrysler and cancelled the deal for the next Titan to be built on the Ram chassis. @ Patrick Rall- Why do you waste your time making nonsense comments like that? Who made you an expert on what a company is capable of. I happen to be a fan of Nissan so I am a little biased, but I'm not going to go around saying that ford isn't capable of building a super car that can compete with the Nissan GT-R. And FYI the Nissan Altima coup is not in the same competitive class as the ford mustang. The current Titan is already adequate competition for the F-150, your just concerned the new Titan will totally outclass the F-150. I've owned them all, Ford, Chevrolet, Toyota and Nissan, I am currently in a company owned Dodge Ram (2013), I have found that other than personal preference, IF YOU ARE NOT DRIVING A NISSAN TITAN, ITS BECAUSE YOU HAVE NEVER DRIVEN A NISSAN TITAN, the Dodge Ram is only on the market because they are cheaper to purchase, (you get what you pay for) from ergonomics to performance to the almost immediate malfunctioning of the bells and whistles (options and such) this is not a smart purchase, I still own a 2005 F-150 4x4, a 1986 Chevy K-10 4x4, 2001 Toyota Tacoma 4x4, all three are very good trucks, my 2008 Titan and my 2011 Titan 4x4's are simply indestructible, a combined 490,000 miles has required no more than routine maintenance, tires and gasoline, do yourself a favor, if fuel mileage is not the most critical factor in your purchasing decision, DRIVE A TITAN!